Bungalow, para 4 personas,frente la playa de Cala d'Or, con piscina comunitaria, no necesita coche a 5 minutos del centro. We stayed at Bungalow number 2. Everything was perfect. Location perfect, apartment perfect. We have an amazing time. The beds are comfortable. The air conditioning is very good and you can just have the fans on. We want to come and stay again next year. Thank you very much for renting us your wonderful holiday home. We stayed in the beach bungalow as a family of four (two children ages 12 and 8) for a week in peak season that commenced on 22nd August. This is our second stay in the beach bungalows we last stayed in 2016 in August in a bungalow further up the road towards the sea but part of the same complex. The bungalow was very spacious with two bedrooms (one twin and one double). Two en suite bathrooms , a galley kitchen, living/dining area and balcony. The air conditioning was excellent in both the main living area and double bedroom it was a welcome relief at times from the heat outside! There was no air con in the twin room but there was a large fan and we found that the air con from the living room cooled down the twin room which was next to this area as long as we left the door open. The bungalow had ample cupboard and drawer space in both rooms to hang clothing and the washing machine and ironing board came in handy it would be especially useful to anyone wishing to travel light. There were ample towels that we washed ourselves during our stay. We did not use the television or coffee machine but both were available in the bungalow. There were two balconies overlooking the beach one with a table and chairs and the other with a clothes airer and two deck chairs. The welcome pack on arrival was a nice touch this consisted of a bottle of wine, breadsticks, olives and two apples. Our reason to return was largely due to the convenient location. The spacious pool is gated and directly next to the beach. This allowed us easily to move between the beach and pool. There are three parasols around the pool and a number of Sun loungers. On both our visits to this location in peak season we have never had a problem obtaining a sun bed. Nobody reserved them and there was no morning rush to 'bag a bed' with a towel. We would arrive at the pool around 10 am and there was always a number of spare beds available and a parasol. One small criticism is that since our last visit the pool is beginning to look a little tired. It is a good size pool and the water was warm but the white walls need a fresh paint and the signage is cracked in places. One of the pool showers was also not fully working. Perhaps this could be fed back to the management company? Some pool lighting would also make the pool more attractive at night. The beach bungalow was next to a bus stop which was convenient we travelled to Cala Mondrego beach by bus and had a pleasant afternoon there. I would say there is no real need to hire a car. The vast number of restaurants were just a few yards up the road along with the local mini markets. We tended to take a twenty minute stroll at night to the mariner as we preferred to eat by the water. The only down side to this bungalow is that it was quite close to a hotel and their noisy evening entertainment (that was of a poor standard) did encroach on us when we wanted to enjoy a quiet glass of wine on the balcony and listen to the sound of the sea! That said, the entertainment was finished by 11pm and once the doors to the bungalow were closed no noise could be heard. Two sets of keys are also essential as everywhere is gated which keeps the place private but if one of you wants to nip from beach to pool or pool to bungalow unless there is a second key you need to move together to prevent people being locked in/ out. This is especially important if travelling with teenagers who want some independence on holiday. 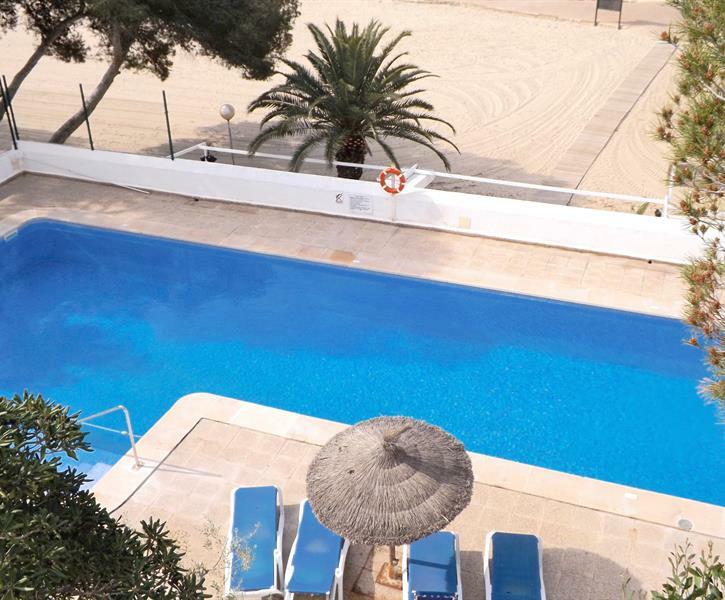 Overall this is a great base in a good location the plus point for us has to be the pool located next to the beach and the fact that you can get a sun bed easily. We would certainly recommend this property . Lovely spacious 2 bedroom apartment with 2 ensuites, two balconies and on a private small complex with a fairly large pool. You could always get sonbeds and it was very private with views to the beach which was accessed via some steps. The apartment had all that you could need for a holiday. The only thing it lacked was air conditioning in the twin bedroom. A beautiful appartment with a lovely view from the terras. Very easy to drive from Gala d`Or around Mallorca for sightseeing.